Sometimes, when the violence and complexity of modern comics gets a bit too much, it’s nice to relax with something ridiculously adorable. The Power Pack were created in the mid-1980s by a rare all-female creative team of Louise “Weezie” Simonson and June Brigman. Granted powers by a space pony (their words, not mine), the Power siblings fought aliens and interacted with mutants and Thor while exploring sibling dynamics, all with age-authentic dialogue. A few years ago, Marvel launched a new set of Power Pack stories set outside of the main continuity and collected in digests, but keeping all of the charm. 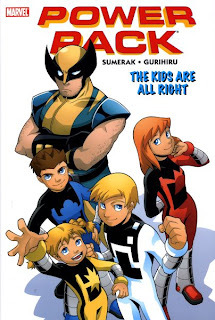 The Power Pack: The Kids Are All Right hardcover collects the first three digests. Sumerak quickly establishes the kids’ personalities. Alex, the oldest, is the leader and strategist who occasionally uses his “big brother” status to boss his younger siblings in and out of battle. Julie is the smartest, although she’s starting to chafe under the pressures of superhero life and her combative siblings. Jack is both the strongest member and the one who causes the most trouble. Out of the twelve issues collected here, at least a third are driven by his impulsive actions. The breakout star is Katie Power. Though technically eight years old, her intelligence and maturity fluctuate. At one moment, she’ll be capably handling fighting the alien Snarks; a few pages later, she’ll be angry over missing Spongebob Squarepants. I give all-ages comics some extra leeway with characterization, especially when it’s in service of a joke. Simonson and Brigman ingeniously gave Katie the strongest energy attack of the four, and it often comes down to her to take down the bad guy. She and Jack have the most antagonistic relationship of the four, which gets a funny reversal in the Avengers team-up issues. All four of the kids clearly love each other and they work together surprisingly well as a team. Each story is driven by real interpersonal problems, like a lack of trust, maturity, or responsibility. After the first four issues kept to the Pack’s own mythology, the later mini-series started pairing the Pack with other Marvel heroes, starting with the X-Men. A pattern eventually emerges: the Power family is going to an event when they run into the hero. The kids help out behind the scenes since their parents don’t know that they’re superheroes. Then there’s a big fight, followed by hanging out with the hero. The third issue collected here teams the Pack with the Fantastic Four, and the two groups share a mini-series later on. It’s a fun set-up, and Sumerak find ways to change it, pairing off the kids and heroes in different combinations. The only thing they don’t do is power-swap, which was one of the neater elements of the old series, but there’s always room for that to happen later. A hilarious running gag is the team’s complete inability to remember to use codenames. Typically, Alex will chastise Jack or Katie for forgetting, only to call out their actual names in the heat of battle. Even though these stories aren’t in continuity, they use Marvel’s characters to their advantage. For instance, the X-Men issues alone use Sabretooth, Mystique, the Circus of Crime, the Marauders and Mister Sinister. I still can’t believe that Scalphunter, leader of the Marauders, was able to be used without a name change. The Avengers books revolve around a time-travel arc, although there’s a great single issue with Captain America meeting up with his elderly World War II buddies at the retirement home where Alex volunteers. Later mini-series would take a more detailed approach, with Spider-Man, the Hulk, Iron Man, Wolverine and Thor all getting their own individual turn with the Pack. It’s especially cute to see the Wolverine issue, since he and Katie Power had a team-up back in the 1980s as well. No matter how good the writing is, the new “all ages” Power Pack wouldn’t be nearly as well-received without the Gurihiru art team. They strike the perfect balance between regular comic book and manga styles. Much of the manga influence comes in the large and very expressive faces. Not only do the characters convey a wide range of emotions, but their features are soft enough to keep the mood light. The bright colors and simple backgrounds will keep all ages of readers focused. The Gurihiru team doesn’t hold back when it comes to panel and page design, either. The opening pages are drawn as if Katie made them with crayons, and I’m always impressed when artists can vary their style in such a massive way. The character designs are wonderful. It helps that June Brigman created unique but simple costumes for the original book. Each kid has their own primary color and symbol with which they can be identified. Despite the differing elements, the costumes have unifying shapes and black areas. I also have to point out the most open “inside gag” in comics, which is that the Power parents, James and Margaret, are visually based on Walt and Weezie Simonson. This does lead to two red-haired parents having one redhead, one brunette, and two blonde children. At the same time, I think it adds to the family element of the series, with the Powers reflecting a real-life family. I think every reader should have a few Power Pack digests in their collection, if not the Power Pack: The Kids Are All Right collection. They’re cheap, fun, well-written, and beautifully drawn. It’s a rare “all ages” book that truly fits the definition. If you’re not a digest fan, you actually save money by getting this full-size, hardcover collection.